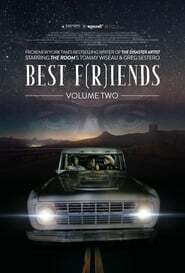 Tommy Wiseau and his The Room co-star Greg Sestero reteam in the trailer for Best F(r)iends. Tommy Wiseau has become something of a living legend in Hollywood, as immortalized in last year’s film The Disaster Artist. Unable to find work as an actor, he wrote a movie for himself and best friend Sestero to star in. The Room is an odd combination of unrealistic moments and extreme strangeness combined into a film that is in no way good – but famously entertaining. With the release of The Disaster Artist to wide acclaim – based on Sestero’s book about his friendship with Wiseau and the unique experience of making The Room – now Wiseau’s story is even more widely known. And he has been enjoying his new found level of fame. From trying to speak when James Franco brought him onstage during the Golden Globes to publicly campaigning to play The Joker, Wiseau certainly seems to be basking in the spotlight.